Louisa is a New Talent Immersion Fellow for South West Creative Technology Network (SWCTN), and this blog will be showcasing some of her research findings. She hopes the fellowship will enable her to build on her work by finding new ways of telling the stories of African, Asian and other ethnic minority people visible by colour. She also hopes to explore how immersive technologies can be used to tell such stories. 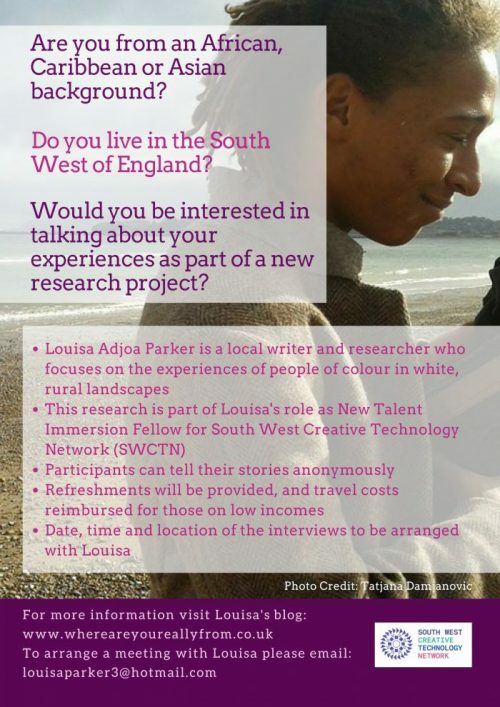 The research questions Louisa will be exploring are around what it means to be a person of colour (the visible ‘Other’) in a white, rural landscape, and how can this experience be communicated to the wider community in a way that generates empathy and leads to a shift in attitudes and understanding. She is particularly interested in the feelings this unusual experience creates in individuals, relating to a sense of self and belonging. Louisa hopes to interview a number of participants and produce a series of podcasts, as well as sharing some of the stories on this blog. Listen to Louisa talking about her work and the new research for her SWCTN fellowship in this short film.